For many of us, the start of summer couldn’t come fast enough as New Yorker’s have grown accustomed to just two seasons: Hot and Cold. After a long and dreary winter, Islanders are hard pressed for entertainment and nightlife. What better way to kick off the hot summer season than a legendary rock concert for the ages? 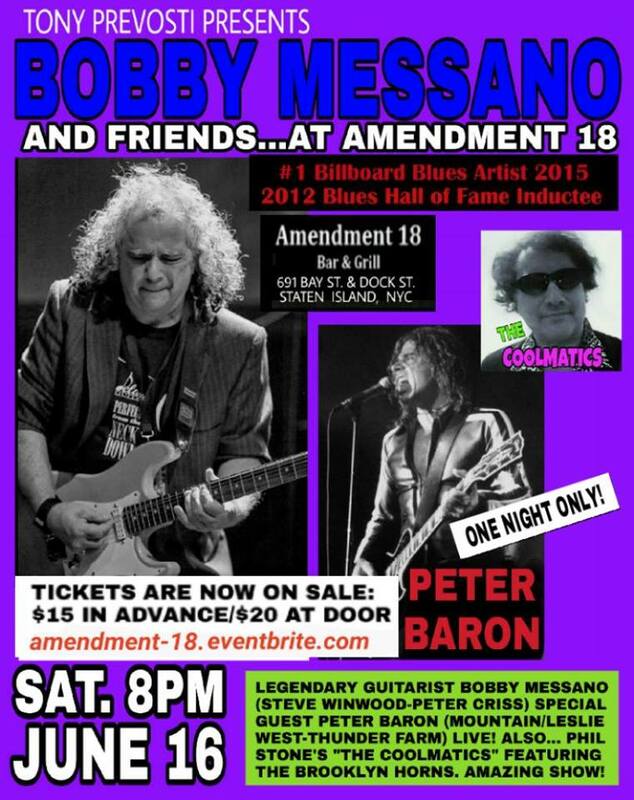 Peter Baron of Mountain, returns to the Amendment 18 stage for the first time this year after a sold out show in October. At 17 years old, Baron was brought on board as the second guitarist of Mountain alongside Leslie West and Corky Laing for the Wild West Show touring the U.S. and Canada. To this day, Baron plays alongside Leslie West and has since started his own bands: Thunderfarm and K2. Performing alongside Baron is yet another household name in the music industry: Bobby Messano. Messano makes his first appearance on the A 18 stage. Since joining the music scene in 1976, Messano has toured with Hall of Fame band’s Boston, the Allman Brothers and has recorded with artist’s Stevie Winwood and Peter Criss of Kiss to name a few. In recent years, Bobby has made a nice niche for himself in the Blues market. Having his hit song “Love and Money” reach number one on Billboards: Top Ten Blues Albums, and since has been inducted into the Delaware Blues Hall of Fame. Rounding up this star studded cast of performers are a group New Yorker’s know well, and need no further introduction: Phil Stone’s the Coolmatics featuring the Brooklyn Horns. The Horns have been rocking the New York bar scene for years, and have one of the most loyal fan bases around. Any time Stone and the gang get on stage, they draw out one of the most loyal and energetic fan bases in town.